Combat encounters in D&D 4e are much more tactical than games I’ve played in the past, relying heavily on combatant positions on the map. I’d love to draw from a rich collection of minis to help bring the game to life for my players, but I need to keep to a budget. In keeping with my approach for condition tokens, I decided to print off some 1” labels and stick them to 1” x 1/8” round wooden cutouts. I used the same technique to insert a tiny magnet in the center of each one. Since these are for my personal use, I used images from D&D Insider and other Internet sources (Bing Image search is your friend) for the artwork. 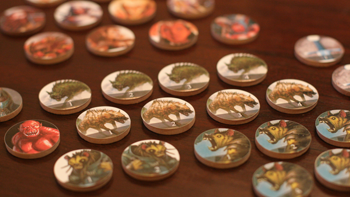 On monster tokens, I added a number to help differentiate individuals during play. Once the players invest some time in their character, I’m hoping that they eventually provide their own artwork (found or created) for their character’s token. I think these tokens look great and I’m sure they’ll help my players picture the battle as it unfolds before them. As for ongoing effort, I’ll just need to use my label template to print off new tokens for new monster types when preparing each game. Over time, I suspect that many of the tokens will see a lot of reuse as well. I’m also thinking I can adapt my system for the tokens in the Monster Vault when I get my hands on that. First game on Wednesday night! I can’t wait.